The best SITE for a pond is the sunniest spot available, away from trees but close enough to vegetation of some kind for baby frogs to reach on their first venture out of the water. Froglet holocaust : it is very easy to kill all your baby frogs in their first few minutes out of the pond. Three years after finishing my third pond the border, which I had wanted to be "natural", had become a jungle of couch-grass, dandelions and other weeds. I decided to upgrade with beautiful natural stone paving which did indeed look very attractive. However, on the day after the first baby frogs climbed out of the pond, the sun came out and I started to find tiny roasted dead-bodies all over the place. The new paving had heated up and there was no cover for about a metre all round the pond. Frogs are so tiny at this stage that they could not even survive a metre in direct sun. I was very upset and spent the rest of that day piling any vegetation I could gather onto the paving and sprinkling the whole site with water (taking care not to drown the froglets instead). So if you are finishing the edge with something solid like paving, make sure you provide cover of some kind until plants have established themselves. A couple of years later, many small plants have managed to take root in crevices and even a tiny pearlwort will afford a froglet some shade. The best way to enjoy watching the pond is stretched out on the ground beside it, so make sure there will be some dry grass or hard-standing for this pleasure. The most magical sight I ever saw from this position was a female newt laying a whole series of tiny white eggs one-by-one on a sunny May day. (Frogs produce dollops of spawn on the surface much earlier in January and February and toads drape ropes of eggs around submerged plants in February and March.) The newt mother would select one particular leaf under the water, then she would lay an egg and use her feet to place it under the leaf, then curl the leaf around the egg so that it was invisible from above, then move on to another leaf and place another egg in position. The best SHAPE for appearance and for maintaining water quality is a perfect circle but if more water can be accommodated by making it oval then go for it. So that some of the pond DEPTH is enough not to freeze (fish if you are having them and ) those frogs that hibernate at the bottom, about half of it should be 75 cm deep. Emerging amphibians and drowning hedgehogs and slow-worms will be greatly helped by creating a beach at some point. Most people like to have a shelf 20 to 30 cm wide and about 10 to 20 cm below the surface around part of the edge for the sort of plants that thrive in shallow water. 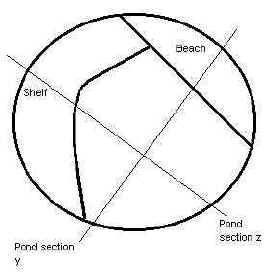 Viewed from above, your ideal pond might look like diagram B , and in cross section through the beach like Y, and through the shelf like Z. The water in your pond will stay level whatever shape you make the hole so it is important to get the liner and the edge as level as the water or it will look dreadful and the liner will be in danger of damage by sunlight. The whole site should be levelled first, if necessary using a builder's plank and spirit level. Most garden ponds can be excavated by hand but disposal of the soil may be a problem. The soil under my large London pond was heavy clay and I had to pay the dustbin men to remove it in sacks. When it came to the Devon pond, I wanted a bank of primroses in the garden and used the soil to build the bank. With a butyl or plastic liner, there is always the danger of tearing or cutting through it so anything sharp (stones, glass, wire, metal, etc.) needs to be removed. The base, the shelf and especially the edge then need to be lined with a layer of sand and padded over that with anything thick enough to protect the liner. Old carpet is excellent but be careful how many friends and neighbours you tell or you will be inundated with unwanted lumps of carpet.